Sturdily bound set of 10 course modules that lies flat for ease of study. In the online edition, we provide the modules as online PDFs. 4 gender studies assignments. Your assignments will be carefully marked with personal advice by an experienced tutor. Self-assessment exercises. They occur throughout the course. How to Succeed in your Distance Learning Course booklet. Tips and advice on how to successfully complete your course. This booklet is not available elsewhere. † Not in the online edition, where most of the content is provided as downloadable PDFs. 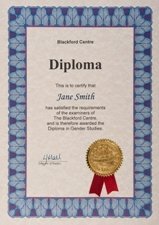 A handsome Diploma (right) to frame and display on your wall. The right to use the post nominal letters Dip. G.S. (BC) after your name.